He became interested in the syndrome after his lovely wife was afflicted, and has been keeping up on research, traveling to multiple specialists, and keeping others informed about any progress toward finding a cause or a cure, no matter how tangential it might be. He shared a recent article with me about endoplasmic reticular stress (ER stress) and the possible linkage to neuropathic pain. “Scientists at the University of California, Davis, have identified a key mechanism in neuropathic pain. The discovery could eventually benefit millions of patients with chronic pain from trauma, diabetes, shingles, multiple sclerosis or other conditions that cause nerve damage. You can read the abstract HERE. An article with more detail is HERE. As you read through the article, you will see the same thing I did. Yes, this looks like a possible link. Yes, they understand how the biological process works. “Inceoglu, working in Hammock’s laboratory, showed that neuropathic pain could be initiated by compounds that cause ER stress and reversed by agents that block it. The work sheds new light on at least one biological process that mediates neuropathic pain, Inceoglu said. With this knowledge, researchers can now test ER-stress blocking drugs in the clinic and carry out fundamental research on how different types of pain grouped under the name “neuropathic” differ from each other and respond to new drugs. No, they have no wonder drugs or treatments on the near horizon. 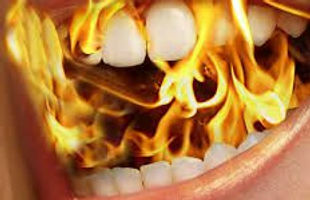 If they did, and they worked, it is likely Burning Mouth Syndrome and other syndromes of exclusion like it could be considered “off label” treatments. In other words, my friends, IF you have formed a good relationship with a Doctor or Neurologist who understands BMS and its effect on your life, IF they feel comfortable prescribing for an “off-label” use, and IF you are not on a med for an underlying condition that could adversely interact with the new medicine…you might get to try it. Just don’t assume your insurance will pay for it. If such a medicine becomes available, be sure you and your Doctor are using “neuropathic” in referring to your pain condition and that may help with any questions that arise. PS: If you are interested, the Klonopin ODT is still keeping my pain at bay better than anything else I have tried. It is something to ask your Doctor about if you haven’t tried it already. Please take this post as encouragement to educate your medical professionals and interest them in helping you find these alternative ways to treat an intractable and life altering chronic pain condition. Because that is what it is, and they deserve to know about it. Some of us have suffered from BMS for over 25 years…still have challenges getting a diagnosis, and still, there is no cure or treatment that works for everyone. The fact that it doesn’t kill us outright is misleading. Doctors know there is a link between chronic pain and depression, and so do we. CHRONIC PAIN MAKES US DEPRESSED, and depression can kill. Keep stressing that order of things, my friends, because otherwise, it is all too easy to pigeon-hole us into, “Menopausal” or Middle-Aged.” That condition is not true for all of us, and so other conditions in common must be looked at and researched. Meanwhile, we wait, and Dennis keeps us informed on the latest research he can find. Thank you, Dennis.